It's mating season in the Minor Leagues. The conclusion of each even-numbered campaign brings with it the expiration of Player Development Contracts, the agreements that bind Minor League clubs with their Major League affiliates. Some PDCs are four years in length, others are two years. As is always the case, the majority of the PDCs that expired following the 2010 campaign were renewed. This is an action that often signifies mutual contentment, although it could also mean that there was simply nothing else available. There are numerous reasons that a change may be sought, with the specifics depending on the perspective. 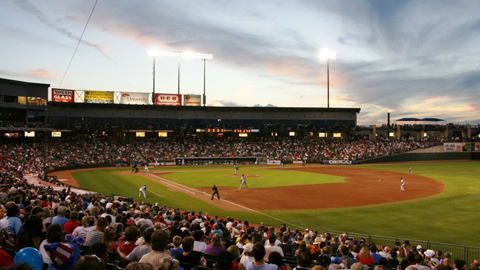 A Major League organization may be unhappy with the facilities provided by the Minor League club, while Minor League teams may seek a parent club more likely to provide the talented farmhands needed to create a consistently winning atmosphere. Both entities may be motivated by geographical proximity, as "clustering" one's affiliates results in increased scouting opportunities and reduced player travel while providing the Minor League club with a valuable marketing angle -- giving fans the opportunity to see their favorite Major League team's prospects in an intimate environment. The 2010 version of this always-intriguing biennial dance has resulted in a bevy of changes throughout the Minors. In this, the inaugural offseason installment of "Minoring in Business," we'll take a look at some of the most notable. In early August, an investment group led by Chuck Greenberg and Hall of Famer Nolan Ryan was finally successful in its bid to buy the Texas Rangers. This long-delayed endeavor resulted in several notable affiliation changes, both owing to Greenberg and Ryan's Minor League involvement prior to their Major League purchase. On Sept. 16, the Rangers announced that they had signed a four-year PDC with the Round Rock Express, who had previously been affiliated with the Houston Astros. The Express, a Pacific Coast League franchise based outside of Austin, Texas, is owned and operated by Ryan-Sanders Baseball (a group that includes Nolan Ryan as well as his son, Reid). The move left the Astros looking for a new Triple-A affiliate, and they soon found one in the Oklahoma City RedHawks (who had been with the Rangers). The two clubs have a history with one another, as the Houston Colt .45s/Astros featured a Triple-A affiliate in Oklahoma City from 1962-'72. Noted: Ryan-Sanders Baseball also owns the Corpus Christi Hooks of the Texas League. But, unlike the Express, that franchise will remain an Astros affiliate despite the newfound family ties with the Rangers. In addition to his new role with the Rangers, Greenberg heads a group that owns the Carolina League's Myrtle Beach Pelicans and the New York-Penn League's State College Spikes. Though the latter remains a Pirates affiliate, the former has been brought into the Rangers family. The Pelicans, formerly an Atlanta Braves affiliate, announced a four-year PDC with the Rangers on Sept. 17. "Because of my roles with both the Pelicans and Rangers, I have the unique thrill of being able to enjoy the announcement of this partnership from both sides," said Greenberg in a press release. "From the Pelicans perspective, we are excited to affiliate with a talent-rich and proven player development system that is committed to winning a Carolina League championship." Noted: The Braves may have lost out on Myrtle Beach, but they soon found a willing new Class A Advanced partner in the form of the Carolina League's Lynchburg Hillcats. And speaking of the Hillcats, the 2011 season will mark their third Major League affiliate in as many seasons. The club was partnered with Pittsburgh from 1995-2009, but that partnership came to an end after the Pirates and Reds engaged in an "affiliation swap" following the 2009 campaign. Pittsburgh bought the Florida State League's Sarasota Reds franchise and relocated it to Bradenton to play as the Marauders, a move that became possible after Cincinnati announced that it would be moving its Spring Training home from Sarasota to Arizona. This maneuver led to the Hillcats and Reds being affiliated for the 2009 campaign. Lynchburg has since moved on to Atlanta leaving the Reds looking for a new home, likely in the California League where Bakersfield is in need of an MLB partner. A distance of more than 2,700 miles between parent and affiliate clubs hardly seems ideal, but in this case it makes perfect sense. The Class A Short-Season Vancouver Canadians announced a four-year PDC with the Toronto Blue Jays on Sept. 17, thereby linking Canada's lone Minor League franchise with its lone Major League franchise. "One of the goals we set out to achieve when we purchased this club was to ensure that baseball fans locally felt like the C's were their team," said Canadians owner Jake Kerr. "I think this pairing with the Blue Jays will bring baseball fans closer together from coast to coast." Noted: The Canadians ended their 11-year partnership with the Oakland Athletics, who have since hooked up with the Vermont Lake Monsters of the New York-Penn League. The A's are, by far, the Western-most parent club in the NYPL, a distinction previously held by the Houston Astros (who remain in the league, having re-upped with the 2010 champs, the Tri-City ValleyCats). The Blue Jays, meanwhile, had previously been aligned with the league's Auburn Doubledays. That club is now an affiliate of the Washington Nationals, who also boast a Triple-A team in the area (the Syracuse Chiefs, located 35 miles from Auburn). The 2010 campaign marked Bluefield's 53rd as an affiliate of the Baltimore Orioles, the longest continuous relationship in all of Minor League Baseball. It would also be the last, as the Orioles announced last month that they were no longer interested in fielding an Appalachian League team. The decision was motivated by Baltimore's glut of teams at the short-season and instructional levels, including clubs in the Gulf Coast, Dominican Summer and New York-Penn Leagues. "We had a relationship with the people in Bluefield for over half a century, and it is a remarkably difficult personal decision for a lot of the people that have been there for a long time and really enjoyed the relationship," said Orioles president of baseball operations Andy MacPhail. But Bluefield wasn't bird-less for long, the Toronto Blue Jays quickly swooped in to fill the void. This marks Toronto's first foray into the Appy League since it ended its affiliation with Pulaski following the 2006 campaign. Noted: With the severing of the Bluefield-Baltimore relationship, the honor of "longest continuous affiliation" is now held by Reading-Philadelphia and Lakeland-Detroit. Both partnerships began in 1967.